When Hopworks Urban Brewery celebrates its anniversary its the loyal fans who come out on top. 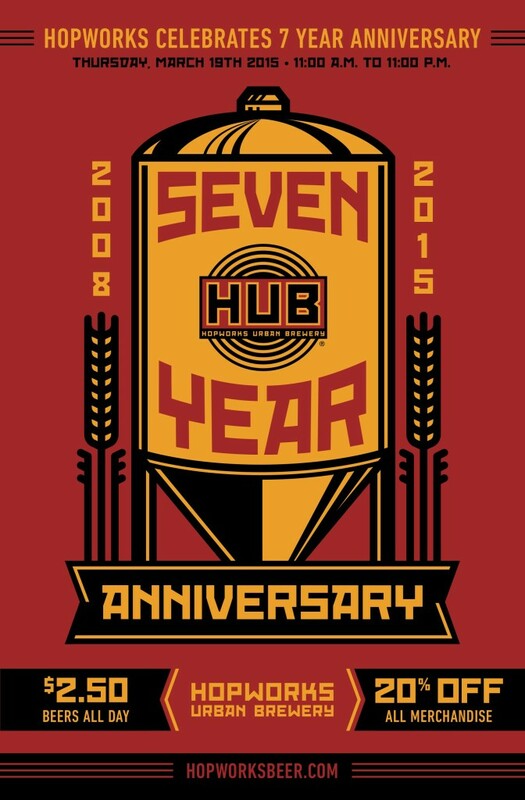 Tomorrow, Thursday, March 19, Hopworks will be celebrating its 7th Anniversary of delivery top quality, sustainable beer and food to the people of Portland and beyond. But is HUB’s patrons the win when from 11:00am to 11:00pm, all of its house beers will be reduced for the entire day. HUB will be offering $2.50 pints of its core beers, $3.50 for its Belgian-style beers, and $4.50 for its Imperial beers! HUB will also taking 20% off all merchandise orders. Sounds like the perfect spot to watch some of the first Thursday of the NCAA Basketball Tournament. New beers on tap include Rise Up Red IRA, one of the first beers HUB brewed and an all-time favorite seasonal. HUB has also tapped Secession Cascadian Dark Ale to celebrate the beginning of the Timbers season kickoff. Finally, HUB will also have Galactic Imperial Red Ale, that mega-hopped interstellar beer that clocks in at 9.3% abv and 100 IBUs.